One of the most interesting lines of Hamilton watches was also it's most significant marketing failure. Today it's not unusual to see all sort of interesting materials used in watches: precious metals, ceramics, titanium, you name it. That wasn't always the case. Hamilton was definitely an innovator in the 1950's. When they introduced their asymmetric models like the Ventura and Pacer, they were major successes. Around the same time, the concept of using a unique material for dials was also proposed. Since different species of wood can be very striking, the idea of creating models with wooden dials was explored. Turns out, creating wooden dials is harder than it sounds. Watch dials are typically only about 17 thousands of an inch thick. That's 0.017" in thickness. Wood that thin isn't very strong so designers naturally landed on the idea of bonding a wood veneer to a thin brass dial blank. But then the wood veneer would have to be even thinner. Many species of wood were considered and eventually Hamilton designers selected a wood called benin. The process of making the dials was challenging so they only pursued dial patterns that were round or square. Despite high hopes, jewelers and consumers alike failed to appreciate the uniqueness of the wooden dialed models and the line only lasted two years. Rene Rondeau wrote a comprehensive article on the subject for a June 1991 NAWCC Bulletin. Five men's watches went intro production along with three ladies models. 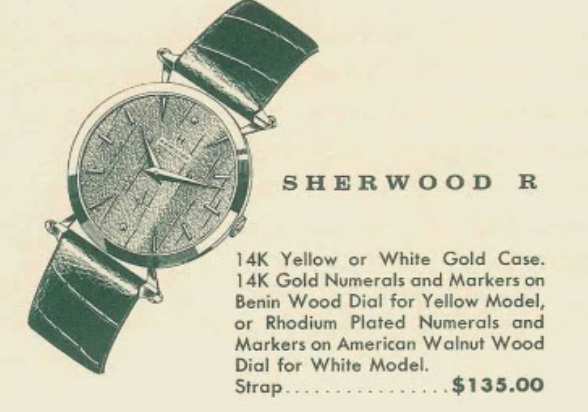 One of the men's models was the Sherwood R. The Sherwood R was available in yellow or white gold. If the Sherwood R looks familiar, it's probably because it was based on another model available the same time (and price point), the Sir Echo. Because the Sherwood line was a marketing failure, they are very scarce models today. In fact, you will very rarely see one come up for sale. A fellow collector of mine recently came across the dial and movement for a Sherwood R and snapped it up immediately. The seller was a pawn shop and said they hadn't sent the case out to be scrapped yet and offered it for sale as well. So a $2500 watch was saved from being scrapped for $250. The watch needed a little TLC so I volunteered to take it on. There is almost no likelihood that I would ever come across another. As received, it looks to be in decent shape. The dial is toned a little around the perimeter. These dials look very fragile to me so I won't do anything to this dial other than handle it with extreme care. There's a presentation on the back that is very fitting for a watch like this. It's to celebrate 45 years of service to the "Wood Mosaic Corporation". You might be tempted to wonder if that's who provided the wood for the dial but it's not. Hamilton partnered with a company called US Plywood. The case is essentially identical to the Sir Echo. I can see the center of the dial is lifting up a little. Perhaps the veneer has separated from the blank. This watch should definitely be kept away from water, just like all vintage watches, but I wonder if the wood should be humidified like a fine guitar would be? Printing on wooded dials was a challenge that Hamilton had to overcome. The uneven texture of the wood grain made it difficult to print their logo clearly. Although the watch runs, it's very apparent that this movement has not been cleaned in a long time. I have done a lot of automatics lately so taking apart a manual winding movement is a welcome break. The 770 is a very well designed movement and it's normally a breeze to reassemble. Everything has been cleaned and dried. Now I can put it back together. Everything looks good after the watch is reassembled. It's ticking away with good motion. I noticed the regulator is at full slow. I wonder what the timer will say? Sure enough, it's running a bit slow. Sometimes when I see the regulator set to full slow I worry that there's a problem with the hair spring. That's not the situation here though. A quick adjustment to the regulator speeds the watch up and all of the other specs look good. I can't say the outside of the watch looks any better than when I received it. In fact, I was asked to do nothing to the watch other than overhaul the movement. The design of the lugs of the case are very slender, so I was happy to comply and avoid the potential embarrassment of breaking one of them off while removing the strap. I think the Sherwood R is a very interesting looking watch. 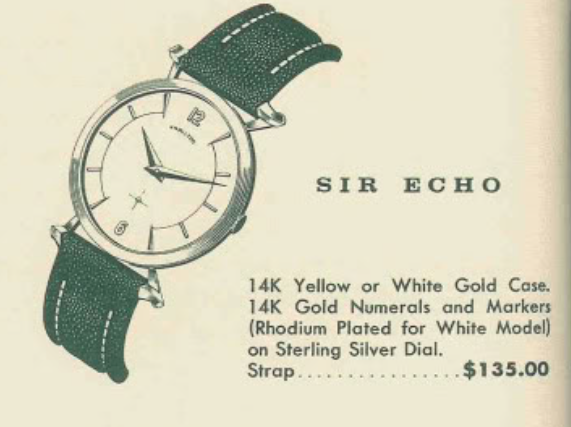 I wonder though, if I went back in time to 1961, given all of the other models in Hamilton's lineup, would I be tempted to get the Sherwood R or the Sir Echo? Such a fine watch would probably have been for special occasions. A wooden dial almost presents like a less formal, casual watch... the sort of thing that goes well with blue jeans and flannel shirts. Maybe that's why they weren't popular with consumers? From a collector standpoint, there are very few of these watches available. In fact, have you ever seen another? This watch will be for sale so if you're in the market, contact me through Etsy or by email and I'll put you in contact with the owner.